Res Ipsa Knit With Her: Timing is Everything! As they say, timing is everything. So just in time for the impending warm weather I have finished two hats! I mean who can't use a good warm hat in 70 degree weather? The turqouise one is for Horsey Girl and the green one is, of course, for Miss K. The girl who has enough green clothes so that entire loads of wash can be nothing but green. Horsey Girl has been wanting a hat with cables and she is pretty happy with the result but she doesn't like the fact that the ribbed brim is folded in half. Oh well, teenagers are never happy anyway are they? 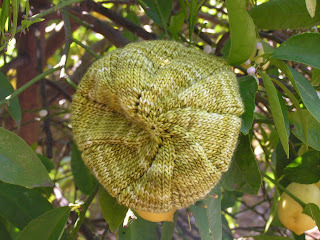 Miss K's is finished with a double seed stich brim and turned out quite cute. I am very happy with it and as a bonus there appears to be enough left on the skein to make another hat which I can donate for the Relay for Life. 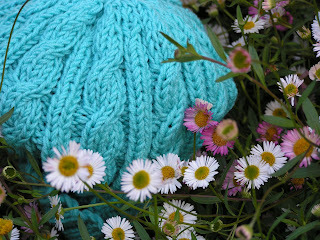 You make the most gorgeous hats! Especially for one living in a warm climate!! !